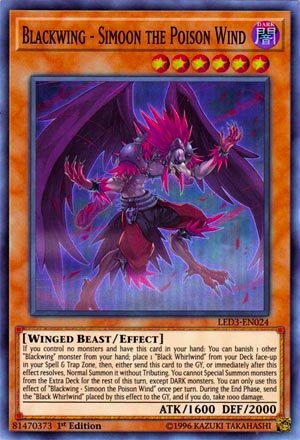 If you control no monsters and have this card in your hand: You can banish 1 other “Blackwing” monster from your hand; place 1 “Black Whirlwind” from your Deck face-up in your Spell & Trap Zone, then, either send this card to the GY, or immediately after this effect resolves, Normal Summon it without Tributing. You cannot Special Summon monsters from the Extra Deck for the rest of this turn, except DARK monsters. You can only use this effect of “Blackwing – Simoon the Poison Wind” once per turn. During the End Phase, send the “Black Whirlwind” placed by this effect to the GY, and if you do, take 1000 damage. Blackwings have so many options for monsters in the deck it is hard to keep up with them. Today we’re looking at Blackwing – Simoon the Poison Wind. First turn Black Whirlwind search for a Blackwing banish from your hand is more than a fair exchange, as yodu’ll summon that turn and get a search to recoup the resource lost. Then you can put this in the grave or use it as your Normal Summon without having to tribute. Blackwings Special Summon a lot so this won’t lock down your turn just by using your Normal Summon. Black Whirlwind does get destroyed at the End Phase and you take 1000LP damage IF it is still on the field. If you somehow get rid of it, then you won’t be taking that damage. Scrap Dragon anyone? This card combos well with Auster The South Wind to make Full Armor Master (can be done in same turn if you have another Normal Summon). At the very least you can use this monster to start a turn strong by searching out a Black Whirlwind and then get some graveyard fodder to be brought back later. Blackwings have needed ways to search out one of their best cards and here it is. Search effect is great, but weaker stats make its use of your Normal Summon less appealing. We end off the Blackwing support by looking at one of their best new Main Deck monsters, Blackwing – Simoon the Poison Wind. Simoon the Poison Wind is a Level 6 DARK Winged Beast with 1600 ATK and 2000 DEF. ATK and DEF could be better for a Level 6, DARK and Winged Beast is great. If you control no monsters and have this card in your hand, you can banish another Blackwing monster from your hand to activate a Black Whirlwind from your deck and then either Normal Summon this card without tributing (does not take up the Normal Summon for the turn, which is great) or send it to the GY. You are likely going to Normal Summon this to get a search off Black Whirlwind, I don’t see a point of sending it to the GY. The banishing a Blackwing from your hand synergizes well with Auster, who you can Normal Summon to get back the Blackwing you banished, and then you can Special Summon many of the Blackwing monsters from your hand to get a Link-2 like Wee Witch’s Apprentice (wish we had a Blackwing Link Monster) and begin some Synchro plays, which if you can summon Nothung and get another Blackwing Normal Summon, you can get a third search if you already used the Normal Summon for the turn. This card easily helps get into Full Armor Master now by opening your plays up. I should also mention the downsides. First off, the turn you use the effect to get Black Whirlwind and either Summon this or send it to the GY, you are locked from summoning monsters except for DARK Monsters, which is fine since Wee Witch’s Apprentice is out and all the Blackwing Synchros are DARK. Another downside is that the Black Whirlwind you get from the deck is sent to the GY during the End Phase and you’ll take 1000 damage, but you can get around this with Zephros bouncing Black Whirlwind to the hand and taking 400 damage instead of 1000. If you can get this and multiple Black Whirlwinds in your hand and have Simoon be live, you can make some insane plays. Simoon is a must three of in Blackwings now, it enables so much. Art: 3.75/5 I assume he is the one causing the Black Whirlwind. Blackwing-Simoon the Poison Wind, is also a relatively different take on a Blackwing card, so let’s take a look. Dark, Winged-Beast, Level 6, 1600 attack (2000 defense) neither of those should really win many contests. But does it matter? You can remove a Blackwing from your Hand (if you also have this in Hand, AND control no Monsters) to place a Black Whirlwind face-up on your Field. So, you now can Normal Summon this card to get some combos rolling. That’s going to give you another free Blackwing, thanks to Whirlwind (it just has to have under 1600 attack, in this instance) then you immediately send Simoon to the Graveyard OR you can Normal Summon it, without a Tribute. Next, you’ll note you aren’t allowed to Special Summon a non-Dark Monster for the rest of this turn. You do take 1000 Damage (which nobody wants to take Damage, I guess this where the Poison comes in) after it’s all said and done when it goes to the Graveyard. I suppose you could always spin Simoon and remove him from play, bounce him back to your Hand or Deck, or just take the Damage. It’s a small price to pay for all he can do for you, right? Blackwing – Simoon the Poison Wind is a great starter card in Blackwings. If you control no monsters and another Blackwing monster in your hand, you can banish the other one to place Black Whirwind directly from your deck to your field (Special Summoning a Spell essentially). Then you can Normal Summon Simoon without tributing and instantly gain the effects of Black Whirlwind. you could also choose to send this Level 6 Dark Winged Beast-type monster with 1600 Atk and 2000 Def to the grave and avoid some downsides. You are restricted from Extra Deck Summons after using this once per turn effect except for Dark Extra Deck Monsters, which basically doesn’t matter at all. You also take 1000 Damage after sending the Black Whirlind from this effect to the grave during the End Phase. However, there are ways to get the banished Blackwing cost back to the hand, and you could spin the Black Whirlwind to the hand and avoid the damage. So the downsides to Simoon are not that bad, but the stats are. Still Black Whirlwind is so important to the deck that this should be run in triplicate.